As the seasons change, the feel of my home changes too. 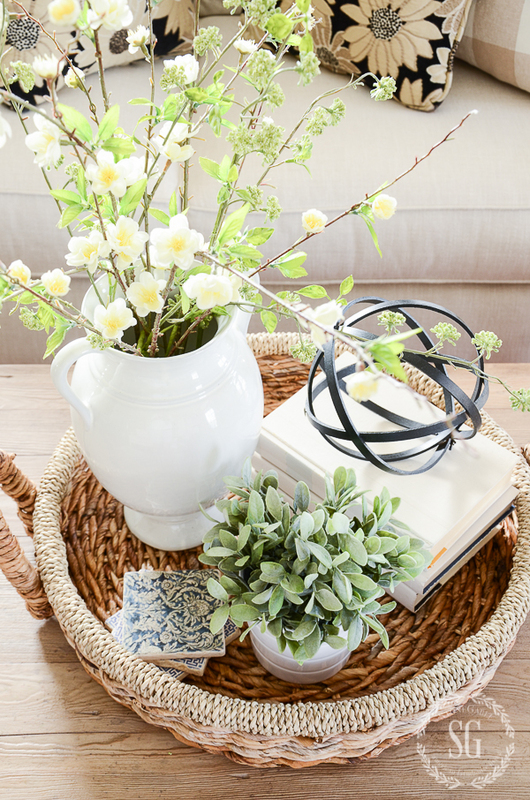 And bringing a fresh, lighthearted feel to my home in the spring is one of my favorite thing to do! The changes are subtle but they do breathe a fresh new life into StoneGable! As I decorate my home for each new season I start with my mantel and then move to the front door and then to the sofas! Why sofas you might ask? 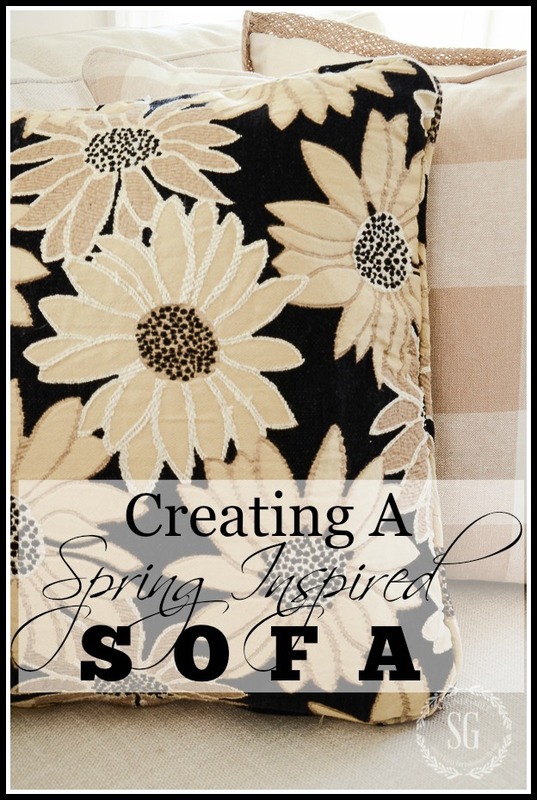 Because it’s so easy to change the look of a sofa with the seasons! Let me show you! Today on our podcast DECORATING TIPS AND TRICKS we are talking about S-O-F-A-S!!!! How to find the perfect one. What to look for in a sofa and some of the different styles. Anita told the most hysterical story about a sofa that we almost had to stop taping because we were laughing so hard! And I’m sharing what a designer said about a brown leather sofa. It’s sorta naughty! And you can hear all 16 episodes and get the show notes HERE too. Don’t forget to take us on the go with your iphone and androids. Listen in your podcast app! Here’s my early spring sofa! Change starts with choosing pillows that reflect the season. This spring I’m going with a not-so-neutral color palette! My accent pillows are definitely bold and a bit sassy! I’m not feeling the soft colors and pastel vibes of spring just yet. It’s still quite cold here so I’m transitioning into spring! I usually mix these flowered pillows with a black and white buffalo check, but to soften the look a little I chose my caramel and white check pillows. If you have a solid colored sofa, big check pillows in different colors are a great investment. 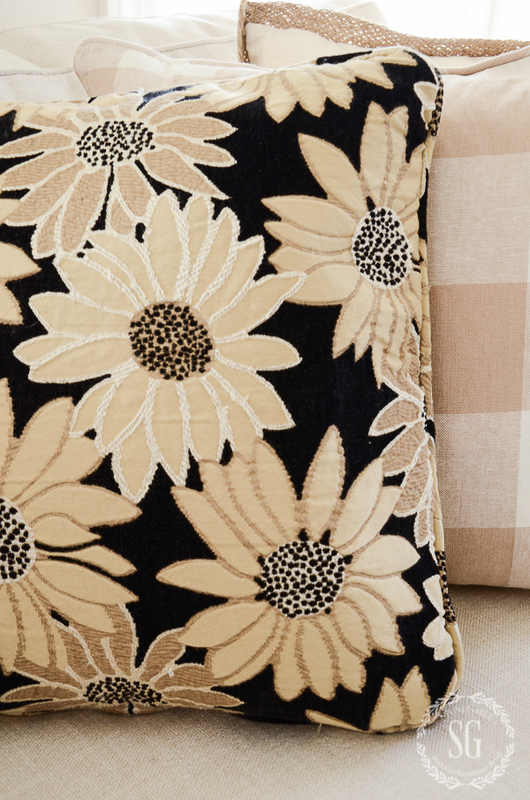 I’ll probably use the black and white check pillows with the bold flower ones in the summer. I found the fabric for these pillows a long time ago when I was looking for a sofa. I didn’t buy the sofa but bought 6 yards of this material. I had two pillows made from it and I think I’m going to cover the seat of a chair I’ll be introducing to my living room soon. Here’s a little tip: Choose colors that you love and stick with them! I have pillows for all seasons in neutral colors. Like these pillows, the colors don’t scream spring but the motif and what I put with it does. It’s so much easier to mix and match pillows if they all work together! Another element to add to a sofa is a soft throw. Even in the summer, I keep one gently rumpled on my sofa. I change the weight and texture and color according to the season. Just like all decor, our sofas love to be layered too! It’s still very chilly here in Lancaster County so I have a pretty thick throw accenting the sofa! As the weather warms I’ll switch it to a lighter one. Put spring details around it!!!! If you have the right pillows and add a throw all you need to do if finish the look with a springy vignette! You eye usually does not pick out just the sofa or just the vignette at first. It takes a picture of the whole area first. Then it bounces from one interesting element to the next. When we look at a room our eyes usually do not pick out just the sofa or just the vignette at first. It takes a picture of the whole area. Then it bounces from one interesting element to the next. So when our eyes see my sofa, they think “spring”! 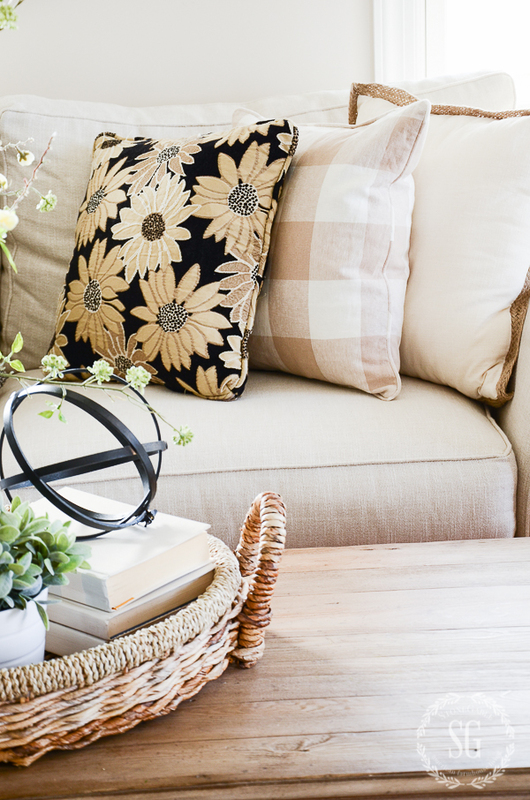 The secret is to make your layered sofa and vignette work together! I’m not opposed to using faux blooms as long as the look very very real! I’ve made the investment in great fakes over the years and now I have a stash that are all extremely lifelike! 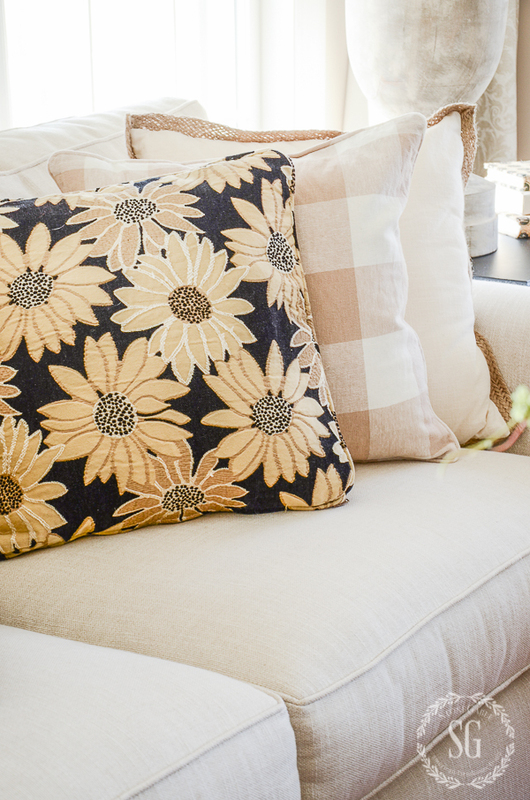 The pillows and the throw and the vignette work together to create a spring inspired sofa! Easy peasy… and now you know my sofa secret! Why don’t you get your sofa ready for spring today? I just found your site on Pinterest and I love it! 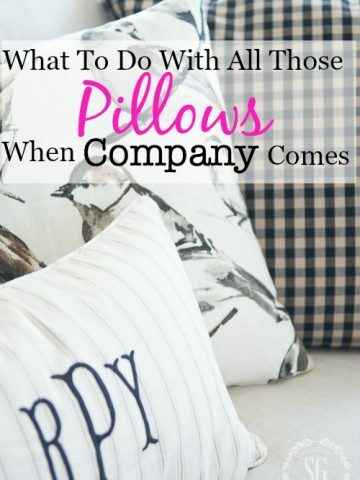 Especially since I am also a pillow addict and love to change pillows with seasons. I have been trying to figure out something new for spring for my dark gray couch. I love your yellow flower pillows. Would you mind sharing where you found them? And also the bird pillows? Hi Jan, I love pillows too! The flower pillows were custom made and the bird pillow was found at a Vintage Fair. Sorry! I have seen the bird fabric on pillows on Wayfair. You might want to look there. Your vignettes are such an inspiration for me to comb Home Goods! I was wondering if you could tell me where you purchased the white two handled ceramic piece? I love it so much! Now I just need to find that gorgeous basket! Williams right? If so did you paint your ceiling a different color, if so could you tell me what color you used. Also could you give me some ideas for a color for my refinished downstairs basement. It doesn’t have any light and it’s pretty much my husband’s man cave. He is a Surveyor, very sloppy and doesn’t think twice about washing his hands when he comes home. There is an off white Berber wall to wall carpet down there all oak, and an emerald green, and burgundy plaid sofa, chair and ottoman. I hope this isn’t asking too much, I really need help, I’m doing this all by myself. I love the way you do neutrals and also the right amount of accessories. I think the larger accessories using less rather then too many little things. I will be watching for “Decorating Tips and Tricks”. I came across your blog on Pinterest. Thank you for the tips on decorating, and I am wondering where may I purchase that exact basket from the above picture. Thanks so much. Hi Nikki, you have asked one of the most asked questions here at StoneGable! The basket came from HomeGoods a few years ago and I have not seen it in stock for awhile. Sorry! I so admire your decorating style. I do have a question. Where do you get pillows made. A regular tailoring place? I found a slipcoverer in my area that also makes my pillows. Look online for someone who does custom draperies. Often a seamstress will make custom pillows. I hope I have helped you in the right direction. I just love your style! Thank you so much for sharing with us. I always look forward to your vignettes, just love them, and look forward to using your ideas in my home. I am an empty nester too and you are an inspiration! Oh Yvonne! You’ve done it yet again. You have the best posts of any blog site and I love the ideas and tutorials and enthusiasm you share! Keep up the most excellent work. I read your posts daily and am so inspired and have even tried a few of your tutorials. fun, fun, fun! Thank you so much. I am so happy that I found your blog and subscribed to your newsletter. I am an older ’empty nester’ who recently remarried after 20 years of widow hood. My husband and I now live in ‘his’ house, and I am working at putting my stamp on it to make it seem more like ‘our’ house. My furtniture is mostly antique finds that I collected over many years, and his is more traditional/rustic farmhouse style. So, I’m trying to incorporate my 100+ year old pieces and accessories with his. I especially enjoyed today’s information about bringing a ‘spring’ look to a room. The house we are living in now is smaller than the house where I lived, so, I’m also struggling to become accustomed to the smaller space. And, I have a bedroom to re-do that currently looks like a man cave bedroom gone bad. So, thanks for the tips! Love your menu for the week. Will try a couple! Thanks! Yvonne, you are an inspiration to me! I have created a vignette for my living room cogfe table. I love it! This week will shop for sme spring looking pillows!! My home makes me happy! Thank you! Absolutely love your sofa. Can you give me an idea as to the brand or where I could find it? My living room is small and I need a smaller sofa. The sofa is a Pottery Barn comfort sofa with “performance” fabric in ivory. I have a foam core down wrapped sofa. I love it but please read the reviews there are a lot of unhappy people with PB sofas. Love that black flower fabric! Great inspiration! 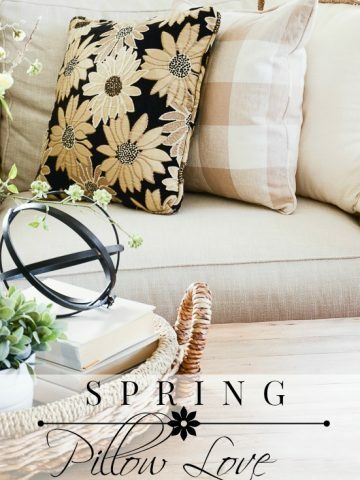 I have a wonderful Ralph Lauren couch, which my husband and I picked up for a steal, and your blog has given me the vision for its spring transformation. Thank you for the visual motivation. SPRING HERE I COME! I’m coming with you Susan! I love the idea of beige for spring, and the basket/tray is darling! 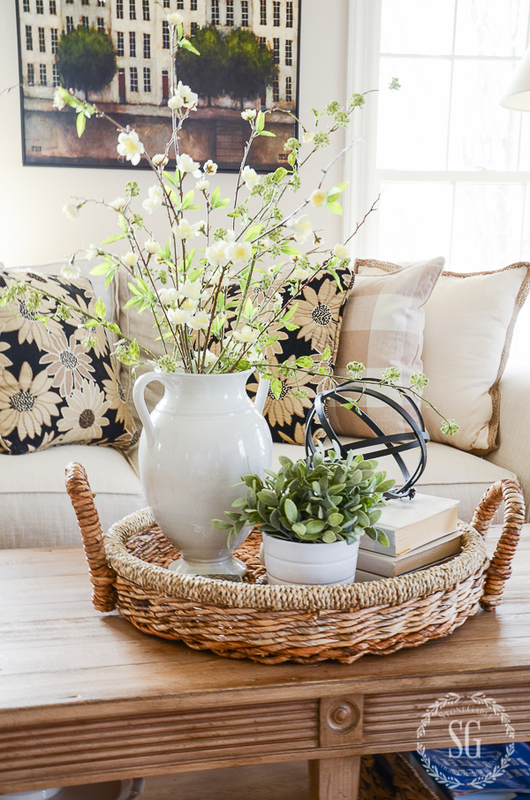 I love the round shallow basket on the coffee table. Where could I find one? Hi Donna, I found that basket at HomeGoods and it was so reasonably priced. If you have a HomeGoods near you it’s a good thing to visit them often as their inventory changes. Love your spring vignette. Thanks for the great visual. I so love your blog and your decorating has inspired me to add more farmhouse touches to our home! I was wondering if you could tell me the type of faux plant you have in the white pot as well the type of flowering branches. I have combed the internet looking for both and am coming up empty handed. They would be lovely additions to our family room!! The little plant you are talking about is from Ikea. They have the best faux plants. And the cutest containers. Hi. Can you tell me where you bought your coffee table? Or if you know the color of the stain. Thank you! Hi Julie! The coffee table came from Ethan Allen. Hope this helps. I have to agree with the Pottery Barn Sofa (no warranty). Bought a slipcovered sofa and at a price of about $1700 you would think they would be great quality. Sagged after about 6 months. I have researched sofas recently as I am in the market for a new one. Rowe (5 year warranty) furniture has the best warranty so far on the slipcovered sofa. I also purchased a Lazy-boy (1 year warranty) in the last three (3) years and am totally dissatisfied. Very uncomfortable and sagging cushions. Its so bad, I bought a piece of foam rubber to put under the cushions for support. I have spent $3400 in 3 years on 2 sofas, ridiculous. Hi! I love your picture behind your couch! Where did you get it? Thanks!!! I love all the decor. Where did you purchase the lamps? Do you recall where you bought the basket? I have been searching and searching for one like this? I just hate it when I have something in my head but can’t find it when I shop. HI Beth, I found the basket at HomeGoods. They have lots of really nice baskets. You’ve inspired me to choose a neutral sofa and change out the pillows each season. As you say, it’s like redecorating! Thanks so much for the good ideas about preparing for Spring. I really like the buffalo check pillows on your sofa. I love the fabric for the pillows! I’m going to be looking at fabric this weekend!! I love those flowered pillow you have…I’ve admired them many times in your pictures. Thanks for another fun post…and more hope that spring will soon be here! Oh my word you ladies are a riot. Great podcast. Good tips on your podcast today. Now I have ammunition for a new sofa since you said the average life of a sofa is 7 years so I will push for one. What do you think of sectionals? We have open concept living space so could handle the bulkiness of one and still have chairs opposite. Definitely will be doing solid and slip covered. Was thinking gray or charcoal but after seeing your off white sofas, I’m liking the lighter color. Here in Nebraska we’ve had some exceptionally warm days already so I have started to decorate for spring and thrown in some bunnies. I have brought out some of my spring pillows and even with the wind blowing it feels like spring in my front room. Thanks for being you!!! Great tips Yvonne. I am in the process of updating my space and although I changed the pillows and lamp shades the space still looked flat. The issue was I used the same leather bound tray. I am going to search for a lighter tray to add to the space and use some updated spring looking faux flowers. I love the use of pillows! It really dresses up or down a room. I so wish I could use pillows with my decorating, but alas, my dogs would not approve! They would always be on the floor! (the pillows that is) Yeah I know, it’s a choice and I choose my fur babies! I do love your rooms! Have a blessed day! Love your post! I like the pillow selection. The pillows are adorable. What a wonderful touch of whimsey! Love your spring vignette on the table…and of course the pillows! It never occurred to me to change pillow COVERS as the season changes. I knew about changing pillows but never did because who has room to store extra pillows. But in the future, I’m going to look for pillow covers. Thanks for the great idea. Love your collection of pillows and neutral colors1 I would love it if you’d do a blog post about styling leather sofas! Love the sofa all ready for spring, love the faux florals they always look awesome. The basket is really sweet. Hi Yvonne, just found your blog today, and needless to say, I haven’t gotten anything done…I have gotten so many ideas..I am purchasing a new home and it is will be a blank canvass…Your black , white and green are my favorite..I also printed off your sugar cookie recipe..So glad your are there for us beginners…Pat, from Lafayette Georgia..
Hi Patricia, I’m so glad you found us! Welcome to the StoneGable family! 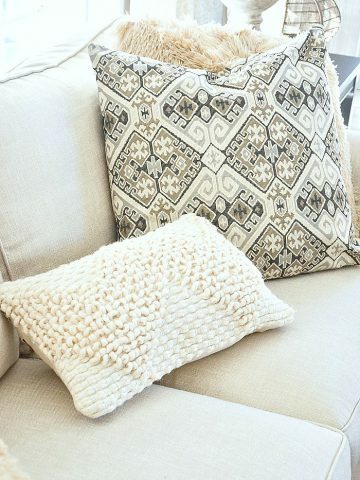 Gorgeous pillows… a simple way to make a major change! Yvonne, I loved seeing your sofa all dressed and ready for spring! 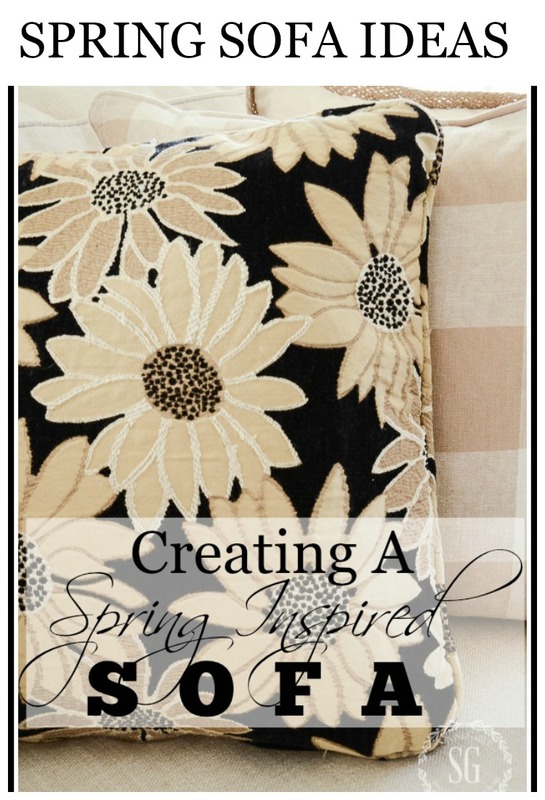 I also loved the spring vignette you created and have pinned for future reference! Thanks for sharing…..Blessings to you! I like the Spring look. Waiting for Spring to get here ! Well I guess I better get shopping for some “springy” pillow fabric! Love the ideas. I wish I had seen your sofa article before now. Just ordered one after months of agonizing over it. 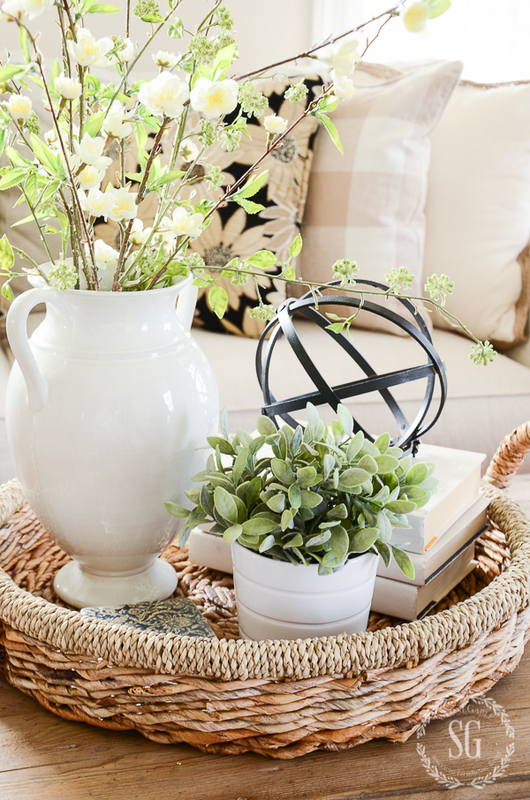 Thanks for the great tips – love your pillows and that round basket tray! Dear Yvonne. I love my home and I love your site. Hi Madame Sabourault! We are actually going to be talking about living in a small area in an upcoming episode of DECORATING TIPS AND TRICKS. I hope you are listening in! I love decorating for spring. Changing things up by using different pillows and updating the coffee table. Thanks again for your inspiration. I love the floral fabric pillows! And you are correct, maybe the colors don’t scream spring, but the print certainly does. So it makes great sense to use them for this transitional period. Such a logical thought, but something I certainly wouldn’t have come up with on my own! Thanks! Yvonne, love your Spring pillows, they look so perky and happy!! You showed how to use neutrals in a fresh and springy way, love it! I am waiting for pillows to arrive, this year it is all about YELLOW for me. I tried pink but the pinks were not right in my room so Yellow it is!! Happy Spring decorating! This is lovely! Not a boring or bland neutral. Thank you for posting these great pictures. Love your color combination. I’m trying to get my home in neutral colors, so then I can accessorize with any colors of the seasons. Oh my goodness! Y’all had me cracking up this morning! I so look forward to every podcast. Love your decor! Beautiful! LOVE your flowered pillows! A perfect choice with your nuetral surroundings. You make everything look lovely! Love how the pillows tie so well with the photo behind the sofa, and the little hints of spring. It’s just right around the corner! I’m so thankful for the ever rotating seasons. Seems like we crave pumpkins and soup by late September and by early March we’re ready for tulips, salads, and open windows. You make it look so easy! Beautiful!!!! Fantastic ideas for spring!! can’t wait to get started on my Sofa too!!! Very helpful as always Yvonne!!! Thank you so much! Thanks for the tips, Yvonne. Can’t wait to listen to the podcast on the way home from work…But, wondering if it will be safe for the drive… I already often laugh out loud during the podcast. Looking forward to Anita’s story. BTW, if you ever need a proof-reader, I’d be so willing to do it for you as a ministry! Always love your pillows! That podcast was so much fun listening to today. You girls just have too much fun!! Love hanging out with you every week! Love this fresh look for spring! Pretty. I love throw pillows. I can’t do white or light colors due to cats & dogs but like you ideas. Very nice! Love the coffee table vignette too! You have the most beautiful cushions. It’s all so beautiful. Love the podcasts:) You three are fun to listen to. Love all your pillows. I’m trying to build a stash like yours. So ready for Spring and warm sunny weather. So beautiful Yvonne!….It really feels like Spring here…everything is blooming! Pillows and lamps, my downfall! Lovely pictures, on my way to Michael’s for some faux spring flowers. Thanks for the spring boost! Everything is beautiful. Love all your ideas and thanks for sharing. Enjoy the week. Do you recall where you found the realistic flower stems? Or some of your favorite places to purchase artificial stems? I am looking for some tall spring blooms to make an arrangement for our church pulpit. Real stems are unrealistic so I’m hunting for excellent ‘fakes’. Thanks for any recommendations! And they are good sources. Hope that helps! I tend to look in local design shops. They usually have them but they are not cheap! Also Pottery Barn carries very nice faux blooms too! Love love the pillow with flowers. So soft but elegant! Just had to click to see your beautiful pictures! pillows…pillows…pillows! Very pretty.The greenery just says spring. Just sat down to take a break after changing out my pillows on my sofa!! How funny. Now need to make an early spring vignette for our coffee table. Have the oblong basket but need some new faux flowers. Feel a trip to Hobby Lobby or Home Goods coming up. You girls are a kick!!!! Thank you for coming into my home through your podcast and bringing joy!!! I have listened to all 16 and have received many take-aways from each one!! Thank you for your Sunday devotionals too. God bless you all of you girls!! Barb! Thanks for listening! We are really trying to pour our best into them. Fabulous pillow fabric! Thanks for always being ahead of the game! I like the vignette on the table. It looks so springy. Curious as to where you got the sofa. I love it and am having trouble finding one like it. Can you post a shop the look perhaps? I also wanted to thank you for your post yesterday. I love that you are a bible teacher who teaches truth without compromise. The sofa came from Pottery Barn. But I can’t recommend them anymore. My kids have pottery barn sofas and they pilled. Getting PB to make it right was so hard. My son and his wife are still trying to get satisfaction! My sofas are fine though. Just letting you know. Hello Yvonne: Your reply here struck a cord with me as I feel the VERY same frustration (as your son and wife) in trying to hear from you! I have emailed six or seven times now attempting to receive the prize (in the form of a cheque) you said you would send me. 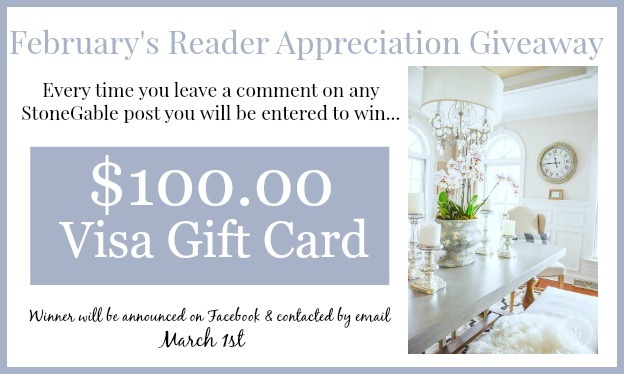 I won the Reader Appreciation prize before Christmas which, unfortunately, was invalid in Canada. As you requested, I returned the gift card to you at my expense and you said you received it. You then said in your email of Jan. 12th that you would send me a cheque – yet I still don’t have it! This is really false advertising and frankly, I am extremely disappointed and shocked you haven’t followed through. At first, I thought it was an oversight and gave you the benefit of the doubt but obviously, it appears that I’m not going to receive my prize. I won fair and square, kept my end of the deal by returning MY $100 gift card to you. If I’d known you were going to keep MY prize, I should have kept my Visa US gift card but I trusted you and returned it as you requested. I’ve read your blog everyday for years now and have taken an active part in suggesting solutions when a reader asked a question that you hadn’t answered as I felt it added to the readers’ enjoyment and might help another reader. I have two friends that are successful Ontario bloggers and they both offer prizes from time to time but follow through on their promises. Like me, they thought it was an oversight on your part as they have enjoyed your blog but they are as surprised as much as I am! I love, love, love you and StoneGable. I so look forward to seeing what you have for all of us that always strikes a chord with me and my design sense. It makes me want to run home and “Start Redecorating”! Beautiful fabric! Loved the podcast on what to consider when buying a sofa. Thank! Your decor choices are always a good look.